The fifth of Bournemouth-based branding agency CuCo Creative’s technical/terminology articles. Over time there have been many standard sizes of paper used across the world, but today these have been distilled down to just two, ISO 216 (A4, A3 etc) and the North American sizes officially only still used in the USA and Canada. ISO 216 evolved from the German DIN 476 standard for paper sizes. and these are based in a single aspect ratio of square root of two. The base format is a sheet of paper measuring 1m² in area (A0 paper size). 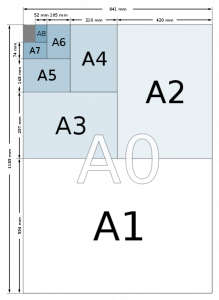 Successive paper sizes in the series – A1, A2, A3, and so forth – are defined by halving the preceding paper size along the larger dimension; therefore if you cut an A0 sheet in half you get two sheets of A1, and so on. This aspect ratio is especially convenient for a paper size, as each size has the same width/height ratio, which allows the easy scaling of work. There are various series of sizes: A, B & C. The A series is used as the standard paper sizes for finished work in print, ie the size the final product is cut down to. The most frequently used of this series is A4, which is 210mm × 297mm. 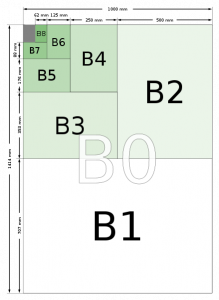 The B series formats are geometric means between the A series format with the same number and the A series format with one lower number. For example, B1 is a geometric mean between A1 and A0. The B series is less common in office use, but it is used for a variety of special situations. Many posters use B-series paper, B5 is a relatively common choice for books and the B series is also used for envelopes and passports. Most print starts life on a B sized sheet; this allows for bleed, crop/registration marks, colour bars and other notes printed in the margins before it is trimmed to size. The C series format was designed for use as envelope sizes, which are designed for use with ISO 216 standard paper sizes (the A series). Metric measurements are the finished envelope size. Inch measurements are approximate. Thus an unfolded A4 sheet or a A3 sheet folded in half will fit into a C4 envelope. The C6/7 will fit an A5 sheet folded in thirds, the A7 will fit an A5 folded in quarters – though neither of these sizes are used often. Although DL is not part of the ISO C series, it is a very widely deployed standard size and is used to fit an A4 sheet folded in thirds or an A5 in half. The ISO 217:1995 standard defines the RA (raw format A) and SRA (supplementary raw format A) formats for untrimmed raw paper. These formats are only slightly larger than the corresponding A formats. Sheets in these formats are cut to the final size format after printing and binding. Great guide – too many folks get confused with the sizing of envelopes and paper supplies, this is a really useful tool that i’ll be sure to link to from our office supplies blog.